What is the difference between a baritone and a euphonium, and how can you tell? My band director sometimes uses them interchangeably, but I am pretty sure that is not correct. All I know is that this has to do with different valving. In the British Brass Band Tradition, the Baritone is a member of the Saxhorn family, whereas the Euphonium is a member of the Tuba family. The Euphonium has a wider bore and a more conical flare over more of the instrument's length, compared to the smaller, shorter Baritone flare. 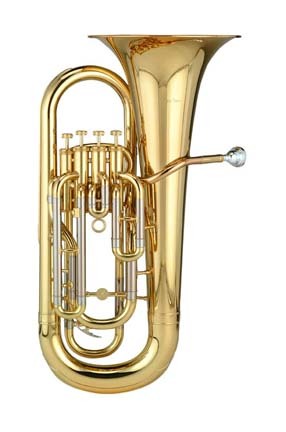 Generally, most Reasonable Euphoniums in the UK will have 4 Valves, arranged 3 upright and one on the side, whereas Baritones would have 3 Valves, although 4 Valve Baritones are now available and used in some Brass Bands. In standard British Brass Bands, there are 2 Euphoniums and 2 Baritones, usually sitting together and frequently playing the same part. Because of the difference in bore and bell size, the Euphonium tends to have a more mellow sound, although the instruments do blend very effectively in the middle of the Band. Modern Composers are starting to write for the Baritone as a separate instrument, often as a downward extension of the Tenor Horn section. The Euphoniums, likewise, tend to be written as an upward extension of the Tuba (Bass) Section. In British Brass Bands, both instruments are written as Bb instruments in Treble Clef. Dave Werden's Site makes a good reference to differences and similarities between the two instruments and also has pictures of the different British and American Instruments..
Cody's summary of the differences between what you will generally find in an instrument called a "Euphonium" vs. one called a "baritone" is mostly spot on for today, but traditionally there really wasn't a difference between the two and it is a recent phenomenon where the high-end instruments are called euphoniums while cheaper student instruments are called baritones. There were 3-valve euphoniums for a long time, though now 4 vs. 3 valves is the most common differentiation among the two. The baritone horn also exists in a front-facing, compact "marching baritone" style which looks quite different but plays similarly. British band composers tended to label their parts "euphonium" since around the turn of the century, while American composers seem to more often have gone with "baritone" often as "baritone (T.C.)" or "baritone (B.C.)" to accommodate performers who were used to reading in either treble or bass clef. Holst's Euphonium part in the First Suite is written in bass clef in the score; but he provides parts in both treble and bass clefs. Notably while the score says "Euphonium" the parts say "Euphonium (Baritone)." When written in treble clef, both the baritone and euphonium play as transposing B-flat instruments (sounding down a Major-9th, like a bass clarinet or tenor saxophone). In bass clef, they sound as written. EDIT: Here's an ad from from Boosey & Hawkes which used to make instruments including euphoniums (and sexist ads, apparently) showing a three-valve instrument called a euphonium. While not disagreeing with tubadaz's great answer, historians often quibble about the origins of various brass horns, and these horns have no shortage of ambiguity over their history. It's no secret that the terms are commonly mixed; a Google Image search for "Baritone Horn" yields a large number of instruments more correctly called euphoniums. The modern baritone horn is derived from a family of narrowly-conically-bored instruments known as saxhorns. tubadaz says they are cylindrically-bored instruments, but he's technically incorrect on that; they're just not as conical as a horn, euphonium or tuba (though more so than the trumpet or trombone, which are typically held up as examples of "cylindrical bores"). He was modestly successful; the family contains ancestors of the modern cornet (sopranino), flugelhorn (soprano), and mellophone (alto), as well as the alto/tenor horn and baritone horn which have changed very little (the main change being a switch from horizontal orientation with rearward bells, popular in marching bands in the Civil War era, to vertical orientation with upward- or forward-facing bells). 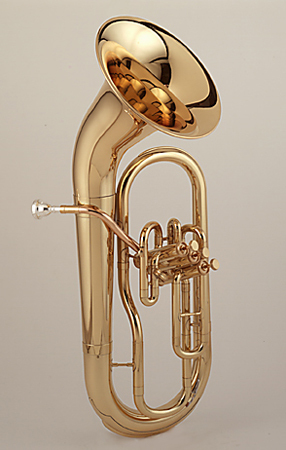 The bass saxhorn has fallen into disuse, though elements of its design can be seen in some styles of tuba. The baritone horn falls in a gradient of tone with other instruments of the same general range; it's slightly more conically-bored and therefore slightly warmer-sounding than the cylindrically-bored trombone, but brighter and edgier than the Wagner tuba and euphonium. The euphonium has a different design path; the intent, from the beginning, was to create a baritone-range instrument with a warmer, sweeter timbre than that of existing tenor instruments like the trombone and saxhorns, more like the French horn and its contrabass helicon cousin (the predecessor to the modern sousaphone and ultimately the concert tuba). This was accomplished by scaling down and rearranging the helicon's circular construction while keeping its wide conical cross-section. Wagner had the same idea after hearing Sax's baritone saxhorn; his creation was the Wagner tuba, achieved by scaling up the French horn Wagner sought to emulate at lower registers. Some euphoniums have three valves, similar to the baritone horn, but the majority nowadays have four, adding the "trigger" valve from the French horn and "double Wagner tuba" which lowers the instruments fundamental by a perfect fourth. As the thumb is typically needed to support a euphonium near the valve tree, this fourth valve is usually either a "pinky valve" similar to modern tubas, or a "compensating" valve on the side of the instrument, used by the index finger of the "non-valve" hand. Core range is virtually identical, other than the loss of the fundamental partial on the baritone; they can be used interchangeably for most military band arrangements. Both can be scored on bass or treble clef (historically the "tenor clef" was also used; this clef is still seen from time to time for trombone but is seldom used for horns). There's some good information above, as well as some confusing details, in this perennial discussion, but many errors still persist. *Of course the baritone can play the fundamental! It may depend on the player, however. The bore size and shape have nothing to do with that! I can play that same fundamental on a baroque trumpet crooked to Bb (9-foot sounding length), and, comparatively, it's bore is much smaller, and so is the mouthpiece. Mouthpiece cup shape and size, and bore shape and size, might make it easier or more difficult, but it doesn't preclude the fundamental being played. In fact, you can get the fundamental on any lip-vibrated aerophone merely by tapping the mouthpiece with the palm of your hand! Also -- let's add the "North American" terminology into the discussion -- What about the tenor horn? Even narrower bore than the baritone. And many old band parts just say "baritone" meaning whatever plays in that range. Often the distinction was more what clef it played -- treble clef = baritone, bass clef = euphonium. Another misconception - Tubas are also saxhorns, and all saxhorns are flugelhorns (meaning more or less conical in bore shape). Here are more terms to define (or maybe NOT! :-) ) -- Bass tuba; Contra bass tuba (in my book the same thing); Bb Bass (in mid-19th century, a wide bore "euphonium" often over-the-shoulder); Bb Baritone (in mid-19th century, a medium-wide bore "baritone" often over-the-shoulder); Bb Tenor (in mid-19th century, a more narrow bore "baritone" or tenor horn, often over-the-shoulder); "Bb Tenor" could also imply a treble clef valved (or not) trombone! a term often used in British brass band arrangements; Bb alto is sometimes a name given to the Bb cornet, and/or Flugelhorn. I have many instruments in my collection in the 9-foot and 18-foot range (and in between) that would defy being pigeonholed into anyone's preset terminology. I have a right-shouldered (but still right handed for valves) helicon, a baritone Centennial horn (which might be classed as a valved bass trombone), and German Band instruments in oval shape with small and large bores. The original name for a double belled euphonium was the doublophone and it was classed as a euphonium and valve trombone in one instrument. I played it today at our Tuba Christmas concert and got brighter sounds from the small bell, and darker sounds from the big bell. It is a York, and it would probably be termed a baritone by the pigeonholers. I also have Bueschers and Conns with 4 and 5 valves, with otherwise identical bore shapes and diameters, and additional DB euphs by other makers. So let's just make music on the things, and stop arguing about terminology (but let's get the acoustic facts correct). Just my two cents, from a guy with 6000 instruments, who plays in vintage brass bands, and leads the Plumbing Factory Brass Band in London Canada. Baritones in a typical British heritage brass band (as here in Australia) are Cylindrical bore in the same manner that trumpets (as opposed to cornets) and trombones are, while Euphoniums are conical bore. Baritones are also generally smaller than Euphoniums allowing them to have a high range for the average player. Having said all of that, I'm a firm believer that Euphoniums produce a much nicer sound in the ensemble on the baritone parts if the player is up to it. In a concert band the Euphonium is universally called a Baritone due to its register only. The 'euphoniums' were ment as 'high bass-horns' comparable with the 'cello' group in the Symphony orchestra's, in French: 'Tuba Basses' The 'Baritone's' are mere a form 'inbetween' the wide-mensured 'saxhorns' used in Brass/Reed bands. In Italian Opera orchestra's, Giuseppe Verdi and his contemporary's/ancesters like Rossini Donizetti & Bellini, preferred though NARROW-mensured trombone-like instruments, valve- operated. This has to do with the sound-formants around 150-300 Hz. The 'broad-warm' couloring of tone is well accepted in windbands, but now-way in the Symphony- opera orchestra's in the 'pit' underneath forwards the podium. This is also the reason, why Giuseppe Verdi together with Atelier Giuseppe Peletti (Milan)ultimately developed a so called 'trombone basso "Verdi" This is a BBb Contrabass-valve trombone -very- narrow mensured long Cylindric chort conic, likewise each Trombone. All these 'bass-horns' were developed out from the bass-valve horns like 'Serpents d'L'Eglise, and 'Ophicleide's sur-named 'C'im-basso (Corno in Basso) wereupon the name 'Cimbasso' is derivated nowadays. The differences between a Baritone and a Euphonium is that a baritone is the same size tubing until the very end, then it gets wider. A euphonium gradually gets bigger throughout the horn. If an instrument has four valves, it is usually a euphonium. Dr. Hank got it right. Comparing a baritone horn and a euphonium is similar to comparing a trumpet and cornet, the trumpet being relatively cylindrical, a fad the cornet conical. Both baritones and euphoniums may have 3, 4, or 5 valves. I once had a Conn 5 valve, double bell instrument, from the early 1900's, which was a baritone horn, smaller bore, smaller bell, shorter in height, and relatively more cylindrical, than Conn's double bell euphoniums of the same period. The difference in appearance is obvious and the Conn case for the baritone was about an inch shorter, and too small for a euphonium. All of the American made euphoniums that I have seen or played have an 11 or 11 and 1/2 inch bell, the only exception being the Martin, bell front model, and one only Conn 3 front action valves, upright bell, which must have been custom made at Conn, because the other horns with the same model number had 11inch bells. Also, the serial number of this particular euphonium put it in a period where the engraving would have been close to the time of transition between the script lettering Conn and the lady face Conn, but the engraving was the later 1950's and 1960's engraving. In summary the baritone is relatively more cylindrical than a euphonium, or the euphonium is relatively more conical than the baritone. I don't think conicality is really the determining criterion. All of my Baritones are very conical, and my 3-valve (1963 Olds Studio) passes the aforementioned "Euphonium" test on the tuning slide (my 2-valves both have the tuning slide on the lead-pipe side of the valves, so the test cannot be applied). I remember the distinction on for the 1979 2-valve King Baritone G-Bugle vs the Euphonium model was bore size and more notably weight. I was a skinny kid back in the day — I could blow enough air to make the Euphonium sound good if I was standing still, whereas with the Baritone I could still put out great sound on the march. Not the answer you're looking for? Browse other questions tagged instruments brass or ask your own question. Will learning trumpet damage my single reed embouchure? How to understand and comprehend the basic major key signatures on the Baritone? Why can a vuvuzela only play one pitch, while a non-valved bugle can play many?